It’s true in life and in ice cream. So for 100 years and four generations, we’ve put the good stuff into our old-fashioned ice cream—like fresh milk and cream, premium ingredients, and plenty of passion. Our good stuff continues to be part of life’s best moments along the way, from birthday parties to warm summer nights to dessert around the table with family. Nostalgia never tasted sweeter than in this ‘50s-inspired flavor. Amaretto ice cream and maraschino cherries come together in this traditional favorite that takes you back. MILK, CREAM, CORN SYRUP, LIQUID SUGAR, MARASCHINO CHERRIES (CHERRIES, WATER, SUGAR, NATURAL FLAVOR, CITRIC ACID, TARA GUM, RED 40), SKIM MILK, BUTTERMILK, MILKFAT, WHEY, MONO- AND DIGLYCERIDES, CELLULOSE GUM, GUAR GUM, CARRAGEENAN, DEXTROSE, ALMOND EXTRACT. PRODUCT HAS BEEN MANUFACTURED ON SHARED EQUIPMENT THAT ALSO PROCESSES EGG, SOY, TREE NUTS, PEANUTS, AND WHEAT. Feeling groovy? Let the good times roll with our mash up of chocolate and marshmallow swirled ice cream, plus Swiss chips and roasted almonds. There’s nothing rocky about this road. MILK, CREAM, LIQUID SUGAR, MARSHMALLOW BASE (CORN SYRUP, WATER, SUGAR, GUM ARABIC, NATURAL FLAVORS, CITRIC ACID), CORN SYRUP, SKIM MILK, BUTTERMILK, SWISS CHIPS [SEMI-SWEET CHOCOLATE (CHOCOLATE LIQUOR, SUGAR, COCOA BUTTER, SOY LECITHIN, VANILLA EXTRACT), SUGAR, CORN SYRUP, CHOCOLATE LIQUOR, BUTTER (CREAM, SALT), COCONUT OIL, COCOA, SALT, SOY LECITHIN], ROASTED ALMONDS [ALMONDS, COTTONSEED OIL, BUTTER (CREAM, SALT), SALT], COCOA (PROCESSED WITH ALKALI), MILFAT, WHEY, CHOCOLATE LIQUOR, MONO- AND DIGLYCERIDES, CELLULOSE GUM, GUAR GUM, LOCUST BEAN GUM, CARRAGEENAN, DEXTROSE. PRODUCT HAS BEEN MANUFACTURED ON SHARED EQUIPMENT THAT ALSO PROCESSES EGG, PEANUTS, AND WHEAT. Relive the glory days of hockey at the Aud with this original Buffalo Sabres flavor, combining butterscotch ice cream with salty butterscotch swirls and roasted peanuts. Let’s go, Buffalo! MILK, CREAM, CORN SYRUP, LIQUID SUGAR, BUTTERSCOTCH SWIRLS [CORN SYRUP, WATER, BUTTER (CREAM, SALT), SUGAR, SWEETENED CONDENSED SKIM MILK (SUGAR, WATER, NONFAT MILK SOLIDS), MOLASSES, SALT, CARRAGEENAN, SOY LECITHIN], SKIM MILK, BUTTERMILK, ROASTED PEANUTS (PEANUTS, PEANUT OIL, SALT), MILKFAT, WHEY, NATURAL FLAVOR, MONO- AND DIGLYCERIDES, CELLULOSE GUM, GUAR GUM, CARRAGEENAN, DEXTROSE. PRODUCT HAS BEEN MANUFACTURED ON SHARED EQUIPMENT THAT ALSO PROCESSES EGG, TREE NUTS, AND WHEAT. Originally part of our Morton’s Homestyle line, our remix of a ‘50s classic features malted vanilla ice cream with chocolate chips. ‘90s kids at heart, this one’s for you! MILK, CREAM, CORN SYRUP, LIQUID SUGAR, SKIM MILK, BUTTERMILK, MALTED MILK BASE [CORN SYRUP, WATER, MALTED MILK POWDER (BARLEY MALT, WHEAT FLOUR, MILK, BAKING SODA, SALT), NATURAL FLAVOR], CHOCOLATE CHIP (SUGAR, CHOCOLATE LIQUOR, COCOA BUTTER, SOY LECITHIN, VANILLA), MILKFAT, WHEY, MONO- AND DIGLYCERIDES, CELLULOSE GUM, GUAR GUM, CARRAGEENAN, DEXTROSE, NATURAL FLAVOR. PRODUCT HAS BEEN MANUFACTURED ON SHARED EQUIPMENT THAT ALSO PROCESSES EGG, TREE NUTS, AND PEANUTS. An ode to our founder, The Good Stuff combines yellow cake flavored ice cream with strawberry swirls (H. Morton’s favorite topping!) and strawberry cream-filled panda paws. Find this new favorite exclusively at scoop shops! MILK, CREAM, CORN SYRUP, STRAWBERRY SWIRLS [STRAWBERRY PUREE, SUGAR, PECTIN, FRUIT JUICE (COLOR), BEET JUICE CONCENTRATE (COLOR), LEMON JUICE CONCENTRATE, NATURAL FLAVOR], LIQUID SUGAR, STRAWBERRY PANDA PAWS [SUGAR, COCONUT OIL, PALM OIL, NONFAT MILK, MILK, COCOA (PROCESSED WITH ALKALI), COCOA, SOY LECITHIN, NATURAL FLAVORS, FRUIT JUICE (COLOR), ANNATTO (COLOR), CITRIC ACID, SALT], SKIM MILK, BUTTERMILK, YELLOW CAKE BASE [CORN SYRUP, WATER, NATURAL FLAVOR, TURMERIC (COLOR), ANNATTO (COLOR)], MILKFAT, WHEY, MONO- AND DIGLYCERIDES, CELLULOSE GUM, GUAR GUM, CARRAGEENAN, DEXTROSE. Product has been manufactured on shared equipment that also processes egg, tree nuts, peanuts, and wheat. Our family-owned business dates back to 1918, when our founder, H. Morton Perry, bought a milk route in Akron, NY. Originally, he operated a home delivery and wholesale business, but our path forward ultimately became clear when Akron Central School’s cafeteria manager asked him to supply ice cream to the school. H. Morton answered the call with his family recipe for ice cream—and, of course, the rest is sweet history. We’ve innovated and changed along the way, introducing our industry’s first machine filled pint containers in the 1950s to cutting the ribbon in 1982 on the state-of-the-art Akron facility we continue to invest in and call home. Through all the flavors we’ve introduced and changing tastes we’ve satisfied, we’ve stayed true to H. Morton’s vision of quality; embracing his insistence to “make sure you put in enough of the good stuff” each and every day. 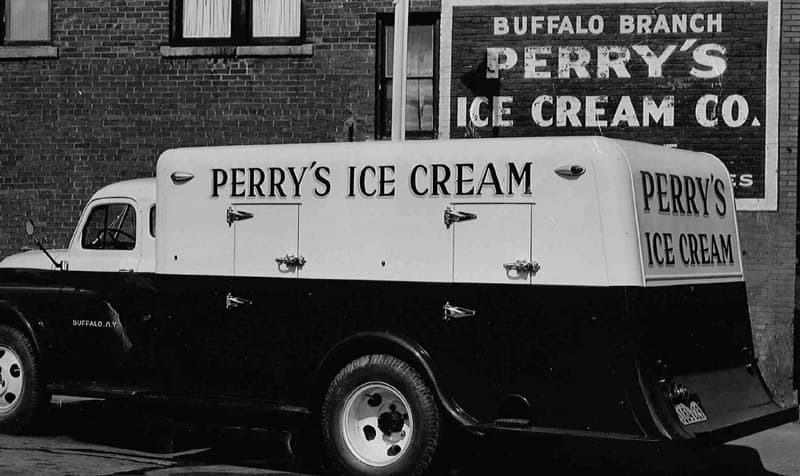 Today, Perry’s continues the spirit of family entrepreneurship as a proud 4th generation business. As Upstate NY’s #1 ice cream brand, we are making more and more old-fashioned ice cream each year and expanding into new markets with our growing team of 375 associates. We look forward to another 100 years of serving up the good stuff that makes all of life’s moments even sweeter. Share your Perry's moments with us on social media.